Firstly, Happy New Year! I was going to post this before the new year but since I had two reflection posts to publish I thought I'd save it for the new year. 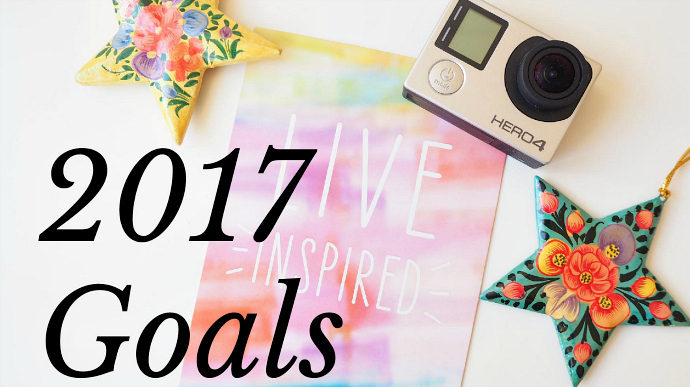 I guess these goals are resolutions in a sense; I'm not normally one for new year's resolutions but I think this year I've chosen goals (both personal and blog related) that are pretty doable. I say that, let's see in a years time whether that's the case. So without further a do here are my 2017 goals which I will try not to forget about the minute this is posted. In fact, I'll put them in my bullet journal to make them more prominent! I hated coffee before I started university. Now I have at least one cup a day. I'm by no means a coffee addict but I am partial to a good cup of coffee. However, I've noticed that I've started to depend on it more, if I'm feeling tired I immediately make an extra strong coffee. But I don't want to rely on it to wake me up. I want to start drinking more herbal tea instead of coffee; partly to be a bit healthier but mostly to avoid having a tonne of caffeine. Ok, this is not exactly a goal but more of a 'to do'. I'm pretty much bloated 24/7, more so by the end of the day. Sometimes I look pregnant (I'm most definitely not) and it's quite (extremely) annoying. Firstly, I do not want to look pregnant and secondly I can't wear my jeans without feeling like a whale. It's become worse over the last month or so but I have been eating a lot more dairy and wheat so I think it may be one of these two that's causing it. But to find out I need to cut them out, probably one at a time, to figure out if doing so will make a difference. I may even go to the doctors to see if they can tell me anything. All I know is the bloating needs to get sorted before I go to Asia so I can walk around the beach without the worry of somebody asking when I'm due. This one's pretty self explanatory. Why would I NOT want to travel?! I'm going to make this a bit more specific though and set myself the goal of visiting 5 new countries, I think this is fairly doable but we'll have to see in a years time where I end up! I survived university without ending up in my overdraft and did manage to budget whilst I was there but I never quite did it properly. I always noted things down and knew how much I had but I wasn't always good at making myself save when I was short on cash. My travel plans for this year involve long term travel so I need to budget more than I normally and be much stricter to make my money last as long as possible. I'm really enjoying being back in the blogging world and want to continue blogging throughout 2017. I'm a bit worried it will die out once I start travelling. I'm unsure whether I'm taking a laptop with me and the thought of blogging on my phone does not fill me with excitement, especially editing and inserting photos. Blogger makes my posts go weird at the best of times so trying to sort out the layout of a post on my phone sounds like a nightmare. I'm sure I'll figure something out though! Ok, more like just as much Netflix but even more reading. I love a good book but unless I'm in the middle of one that I can't put down I always choose to watch something on Netflix rather than read. In my 25 before 25 post I said that I wanted to read 50 books so I need to get started. I have a book shelf full of books that I'm yet to read so I may just pick one at random and start! I have about three of these on the go. Don't get me wrong I love scrapbooking but I need to be in the right mood. I'm very good at starting them but never finishing. I have one just for Interrailing, one for India and then one with a collection of trips. None of them are finished. I really want to finish them all before I go on my next big trip otherwise they may end up unfinished forever. Considering I love travel so much I'm not very good at being spontaneous, I like to know exactly what I'm doing and usually have my route well planned out. I also like to know specific plans form day to day, I don't like to suddenly be told I'm going out in the evening on the day. My first thought when I'm asked to do something is 'what could go wrong' but I want to change that to 'why not'. This doesn't mean I suddenly want to decide to jet off on an adventure the day before but if new plans are made or a friend asks me on the day to meet up I'm going to aim to say 'Yes, why not!' rather than 'I'll let you know' and think of all the reasons why I shouldn't go or do that thing. There's my goals for 2017, I'll most likely think of more as soon as I hit publish but I can always add them in. What are your goals for 2017, leave me links to any posts you've written about them.